They will no doubt find a wonderful home here. I just ordered my new copy from Amazon for 31.00... what a steal. Our plans are well under way for our Spring workshop. The venue will be held at the Ravenna Community Hall on Saturday March 31, 2012 from 9:00am to 5:00pm. 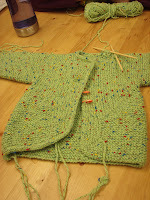 Joining us this year will be Kate Atherley (aka Wise Hilda Knits blog) from Toronto. Here’s a glimpse into her bio. Kate Atherley, a.k.a. Wise HildaI'm a teacher, designer and writer, based in Toronto. 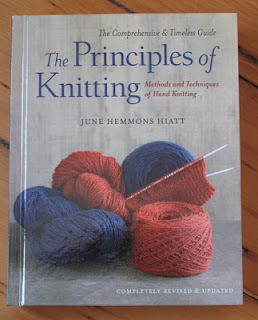 My book "Beyond Knit and Purl" has been praised for its fresh approach to teaching knitting. The other teacher joining us is Glenna C. (aka Crazy Knitting Lady – Knitting to Stay Sane blog) Here’s a glimpse into her bio. 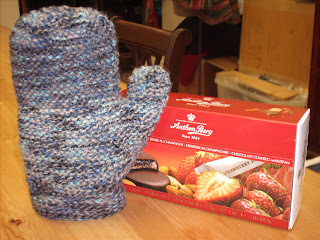 For all the knitters looking for a fast fun mitten pattern try Sally Melville's knit flat mitts and hat. 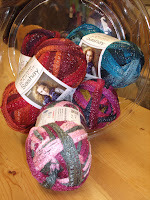 I chose Vienna a yarn from Naturally. It works up lovely and soft. I customized the mitt length to fit my hand- since I know that garter stitch can grow, I wanted a good fit without too much room at the finger top..The Anthon Berg cookie was full when Ruth brought it to class... just a wee bit of Danish delight... Mitt #2 is almost finished and then of course comes the knit flat hat... since the weather is turning back to winter again, I'll need a good fitting fashionable hat..
After passing through 9 towns, four states and crossing the border, my order should arrive today. The excitement around weaving with colourful yarns is - What will it look like... even when we knit we wonder how it will stripe out. 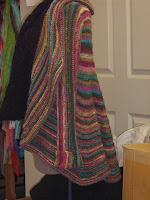 Well, once again a beautiful creation from Cheryl using our Regia sock yarn. When grandchildren start arriving suddenly your knitting projects change size. This beautiful piece was created by one of our Wednesday knitters Arlene for a new soon to be grandchild. Have a look at the i cord edged Baby Surprize jacket... oh so fab!! !